Scoops from A Rocky Road Life. 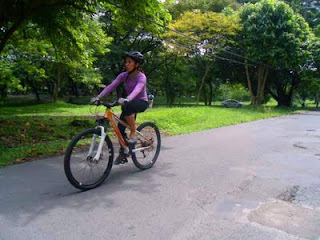 After a six-month hiatus, the new and improved Becky treaded the streets of UP Diliman with a spanking paint job, disc brakes, a new wheelset, new grips, and best of all, the renewed confidence of its rider. Becky (full name Becky Velo) will hit the off-road trails, hopefully sometime soon. © Charisse Salinas 2017. Simple theme. Powered by Blogger.